This is a consignment item. A 3% buyer's premium ($39.00) will be charged at checkout. "The Justice Society of America Initiates Johnny Thunder!" Flash becomes honorary member. Script by Gardner Fox. 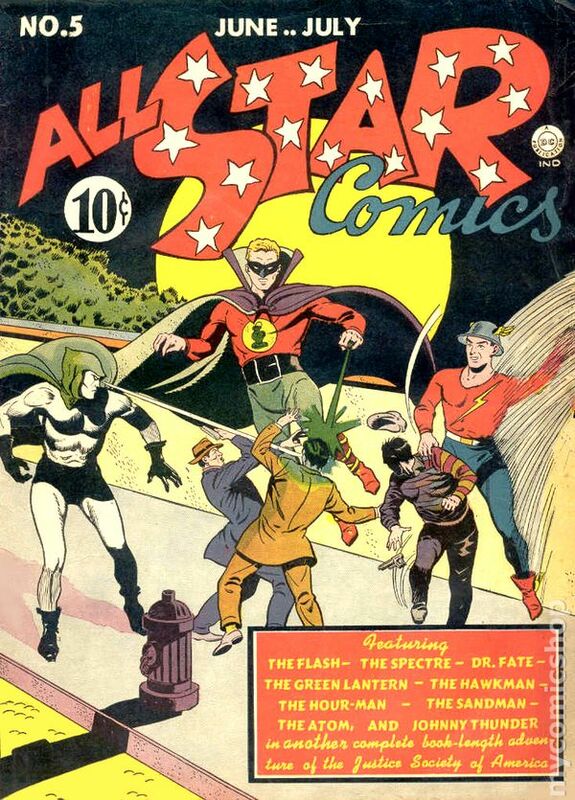 Individual chapters feature the Flash (art by Everett E. Hibbard), Johnny Thunder (art by Stan Aschmeier), Doctor Fate, the Sandman (art by Cliff Young), the Hour Man (art by Bernard Baily), the Atom (art by Ben Flinton), the Spectre (art by Baily), Green Lantern (art by Irwin Hasen), and Hawkman (art by Sheldon Moldoff). Two-page text story, "Dr. Mid-Nite Thinks Fast!" (script by Charles Reizenstein, art by Sheldon Mayer). Hibbard cover. Cover price $0.10. This is a consignment item. A 3% buyer's premium ($60.00) will be charged at checkout. 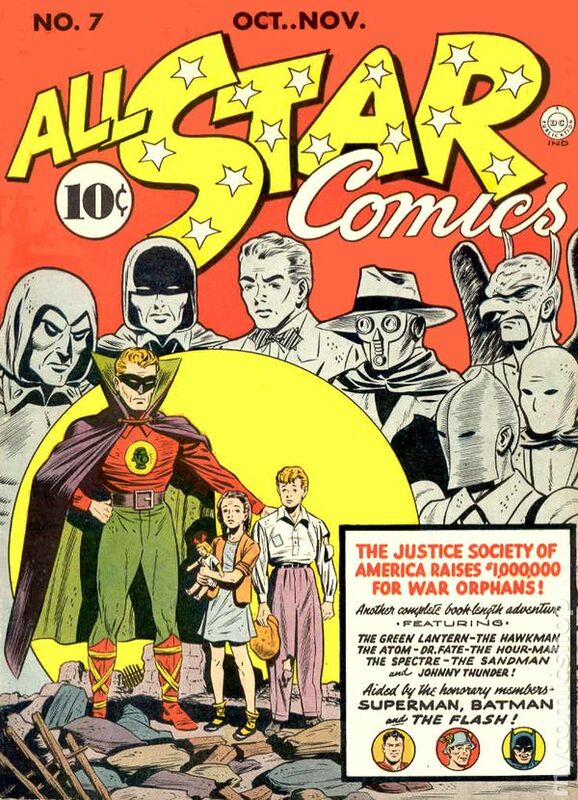 Justice Society of America raise money for war orphans in this book-length adventure, "$1,000,000 for War Orphans." Plot by Gardner Fox and Sheldon Mayer, script by Fox. 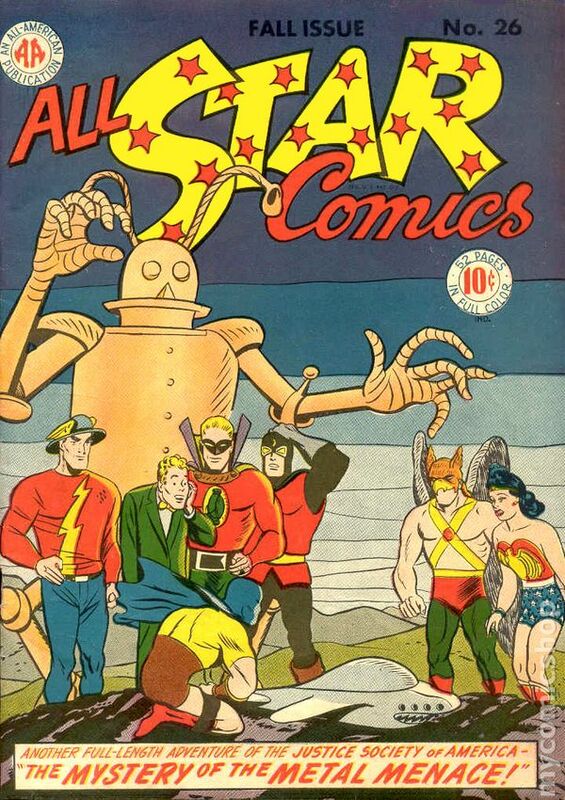 Art by Everett E. Hibbard plus individual chapters featuring Green Lantern (art by Martin Nodell), the Spectre (art by Bernard Baily), the Atom (art by Ben Flinton), Doctor Fate (art by Stan Aschmeier), Hawkman (art by Sheldon Moldoff), the Sandman (art by Cliff Young), the Hour Man (art by Baily; final issue), and Johnny Thunder (art by Aschmeier). Batman, Superman, and Flash cameos. Doiby Dickles appearance. Two-page Hop Harrigan story, "Secret Airport" (art by Mayer). Hibbard cover. Cover price $0.10. This is a consignment item. A 3% buyer's premium ($2,310.00) will be charged at checkout. 1st appearance and origin of Wonder Woman (script by William Moulton Marston, art by Harry G. Peter). 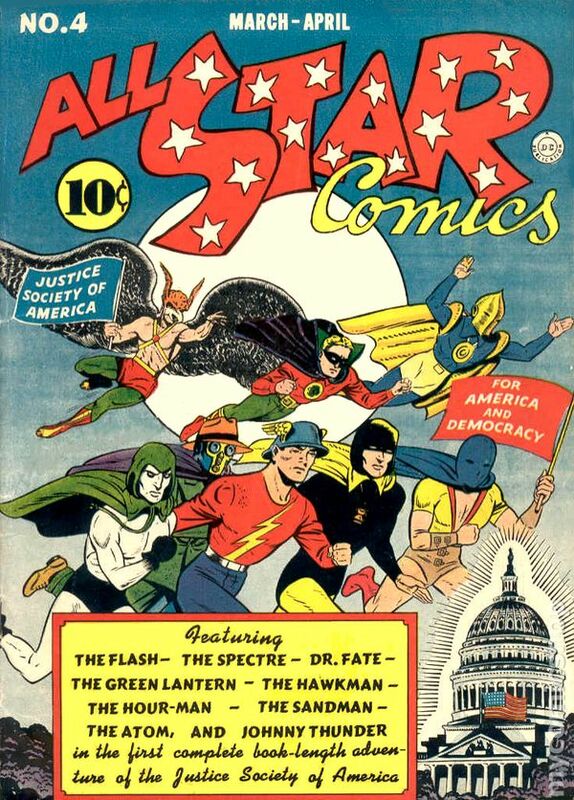 Starman and Dr. Midnite become members of the Justice Society of America in this book-length adventure. Plot by Gardner Fox and Sheldon Mayer, script by Fox. 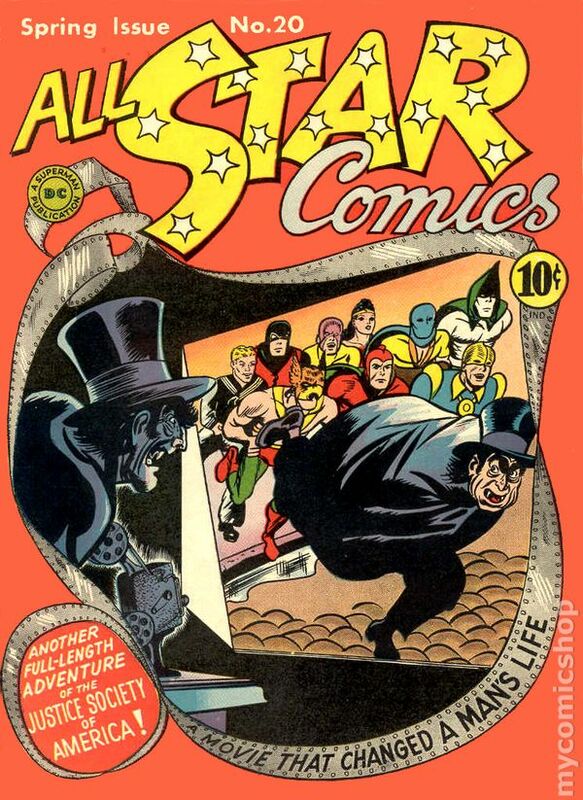 Art by Everett E. Hibbard plus individual chapters featuring Dr. Mid-nite (art by Stan Aschmeier), Doctor Fate (art by Aschmeier), the Atom (art by Ben Flinton), the Sandman (art by Cliff Young), Starman (art by Jack Burnley), Hawkman (art by Sheldon Moldoff), the Spectre (art by Barnard Baily), and Johnny Thunder (art by Aschmeier). Green Lantern voted an honorary member (no appearance, however). Doctor Fate gets a new helmet. Two-page Hop Harrigan text story, "Sky Cutups" (art by Mayer). Half-page ad for Green Lantern 1. Full-page ad for Sensation Comics 1 (Wonder Woman). Hibbard cover. Cover price $0.10. This is a consignment item. A 3% buyer's premium ($28.47) will be charged at checkout. CGC CONSERVED GRADE. Conservation includes: tear seals to cover, cover cleaned. This is a consignment item. A 3% buyer's premium ($16.53) will be charged at checkout. 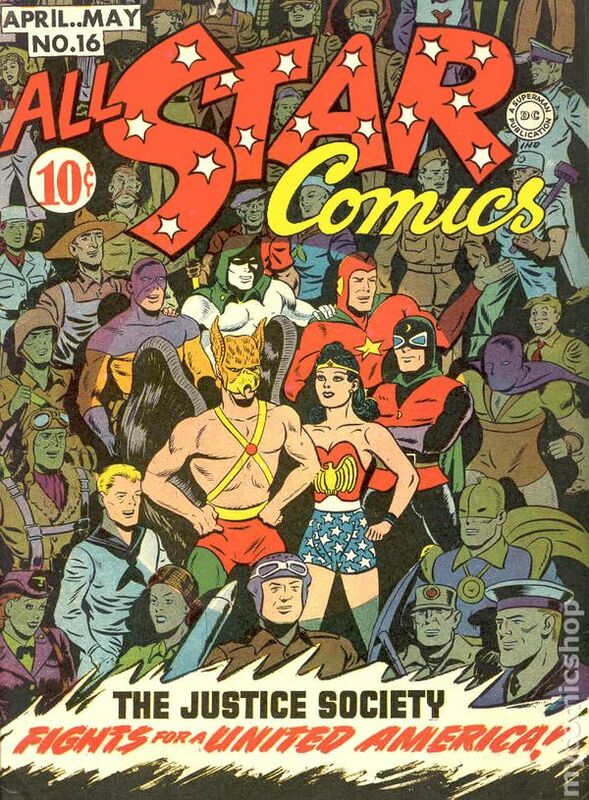 The Justice Society of America in a book-length adventure that takes the heroes to Central and South America, "Hemisphere Defense." Plot by Gardner Fox and Sheldon Mayer, script by Fox. 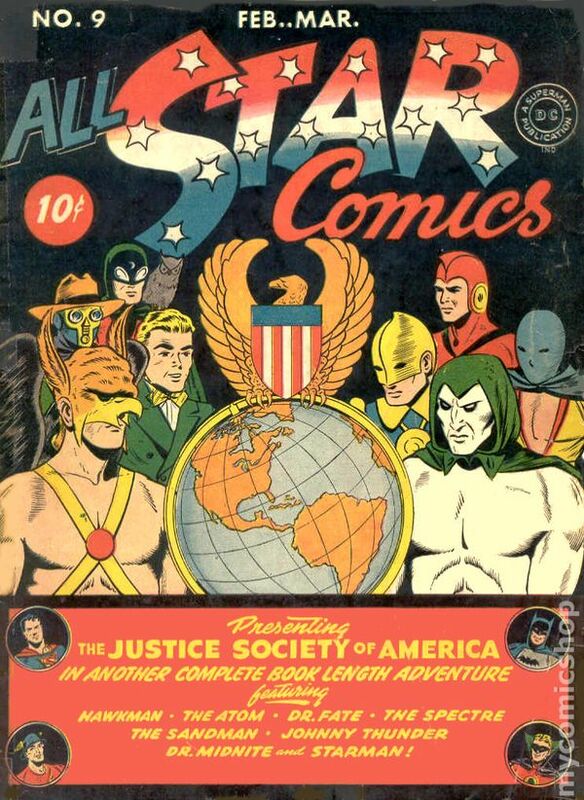 Art by Everett E. Hibbard plus individual chapters featuring Hawkman in Mexico (art by Sheldon Moldoff), the Spectre in Argentina (art by Bernard Baily), the Atom in Chile (art by Ben Flinton), the Sandman in Venezuela (art by Cliff Young), Johnny Thunder in (a pre-Castro) Cuba (art by Aschmeier), Doctor Fate in Brazil (art by Howard Sherman), Starman in Bolivia (art by Jack Burnley), and Dr. Mid-Nite in Columbia (art by Aschmeier). Girlfriends cameos; Shiera appearance; J. Edgar Hoover (FBI) made associate member. Two-page Hop Harrigan text story, "Midnight Meeting." Hibbard cover. Cover price $0.10. The Justice Society of America travels 500 years into the future in "The Case of the Bomb Defense Formula." Plot by Gardner Fox and Sheldon Mayer, script by Fox. 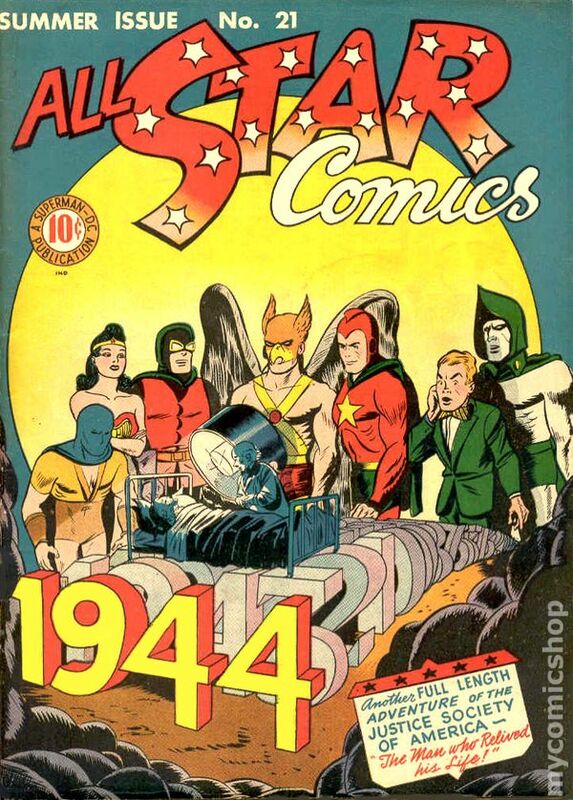 Art by Everett E. Hibbard plus individual chapters featuring Hawkman (art by Sheldon Moldoff), the Sandman (art by Cliff Young), the Atom (art by Ben Flinton), Starman (art by Jack Burnley), Doctor Fate (art by Howard Sherman), Dr. Mid-nite (art by Stan Aschmeier), the Spectre (art by Bernard Baily), and Johnny Thunder (art by Aschmeier). Flash and Green Lantern cameos. New Sandman costume. Two-page Hop Harrigan text story, "The Ghost Plane." Hibbard cover. Cover price $0.10. This is a consignment item. A 3% buyer's premium ($54.00) will be charged at checkout. This is a consignment item. A 3% buyer's premium ($26.55) will be charged at checkout. 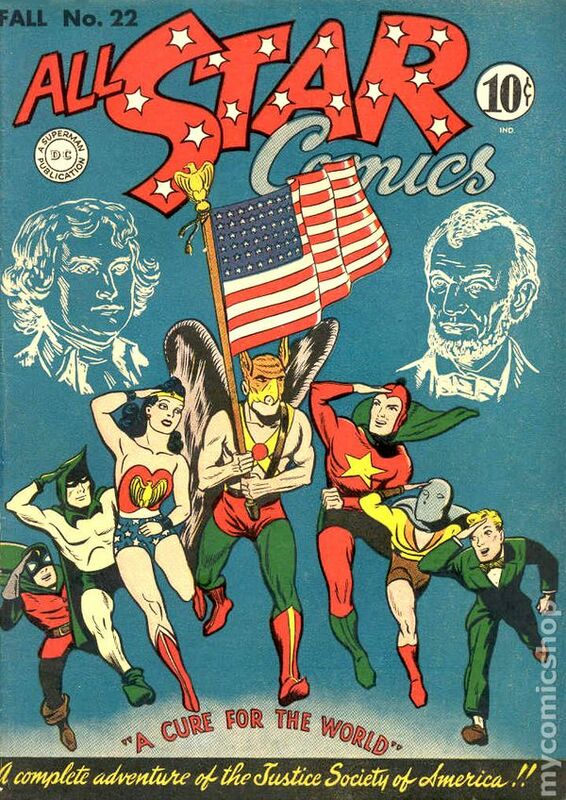 "The Justice Society of America Joins the War on Japan!" Plot by Gardner Fox and Sheldon Mayer, script by Fox. Art by Jack Burnley plus individual chapters featuring Hawkman (art by Sheldon Moldoff), Wonder Woman (art by Harry G. Peter), the Sandman (art by Cliff Young), the Atom (art by Ben Flinton), Doctor Fate (art by Howard Sherman), Dr. Mid-nite (art by Stan Aschmeier), Starman (art by Burnley), and Johnny Thunder (art by Aschmeier). Two-page Hop Harrigan text story, "Outlaw Plane." Moldoff cover (assisted by others?). Cover price $0.10. Restoration includes: very small amount of color touch on cover, small amount of glue on cover. The Justice Society of America continue their fight against the Japanese in "The Black Dragon Menace." Plot by Gardner Fox and Sheldon Mayer, script by Fox. Art by Jack Burnley plus individual chapters featuring Hawkman (art by Sheldon Moldoff), the Sandman (art by Cliff Young), the Atom (art by Ben Flinton), Starman (art by Burnley), Doctor Fate (art by Bernard Kleini), Dr. Mid-nite (art by Stan Aschmeier), the Spectre (art by Bernard Baily), and Johnny Thunder (art by Aschmeier). 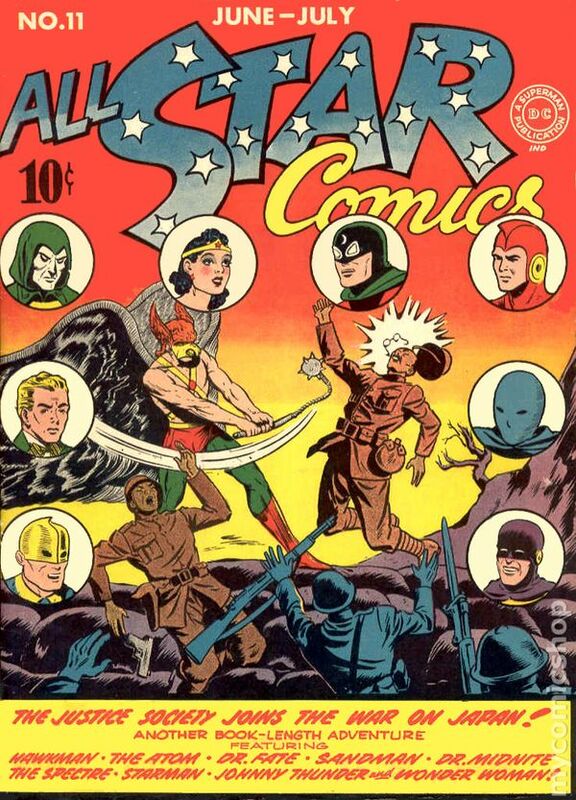 Wonder Woman cameo--she becomes the JSA Secretary(!). Two-page Hop Harrigan story, "Mystery Island." Full-page ad for Wonder Woman # 1. Burney cover (assisted by others?). Cover price $0.10. 1" spine split from top of comic, centerfold detached at one staple. This is a consignment item. A 3% buyer's premium ($4.80) will be charged at checkout. It has been graded by MyComicShop's experienced graders. 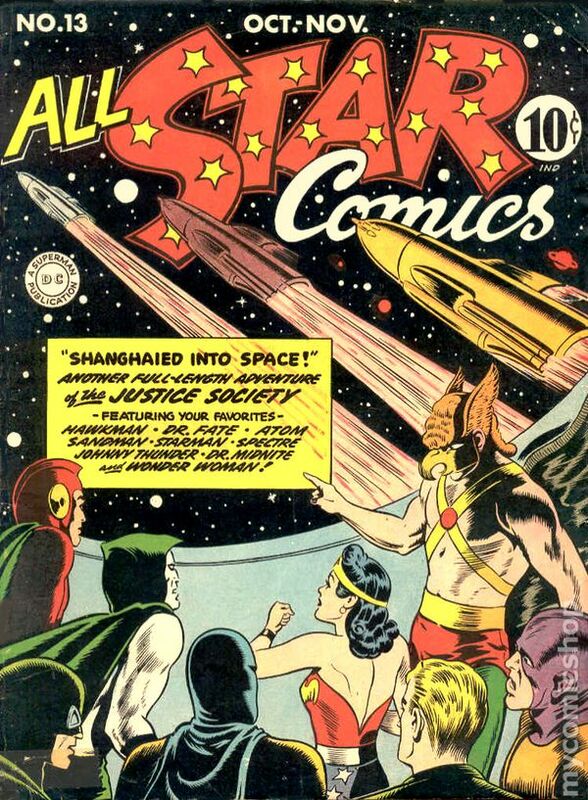 The Justice Society of America are "Shanghaied Into Space" in this science fiction tale. Plot by Gardner Fox and Sheldon Mayer, script by Fox. Art by Jack Burnley plus individual chapters featuring Hawkman (art by Sheldon Moldoff), the Sandman (art by Cliff Young), Dr. Mid-nite (art by Stan Aschmeier), Starman (art by Burnley), the Atom (art by Joe Gallagher), the Spectre (art by Bernard Baily), Johnny Thunder (art by Aschmeier), and Wonder Woman (art by Harry G. Peter). Two-page Hop Harrigan text story, "Turtles and T.N.T." Half-page ad for Wonder Woman # 1. Burnley cover. Cover price $0.10. The Justice Society of America battle the Nazis in Europe in "Food for Starving Patriots!" Plot by Gardner Fox and Sheldom Mayer, script by Fox. Art by Joe Gallagher plus individual chapters featuring Hawkman in France (art by Sheldon Moldoff), Starman in Poland (art by Lou Ferstadt), the Atom in Holland (art by Gallagher), Doctor Fate in Germany (art by Howard Sherman), Dr. Mid-nite in Norway (art by Stan Aschmeier), the Spectre in Belgium (pencils by Pierce Rice, inks by Bernard Baily), Johnny Thunder in Czechoslovakia (arg by Aschmeier), and the Sandman in Greece (art by Joe Simon, Jack Kirby, and Howard Ferguson). Brief Wonder Woman appearance. Two-page Hop Harrigan text story, "The Statue of Buddha." Junior JSA Club begins with membership offer. Gallagher cover. Cover price $0.10. 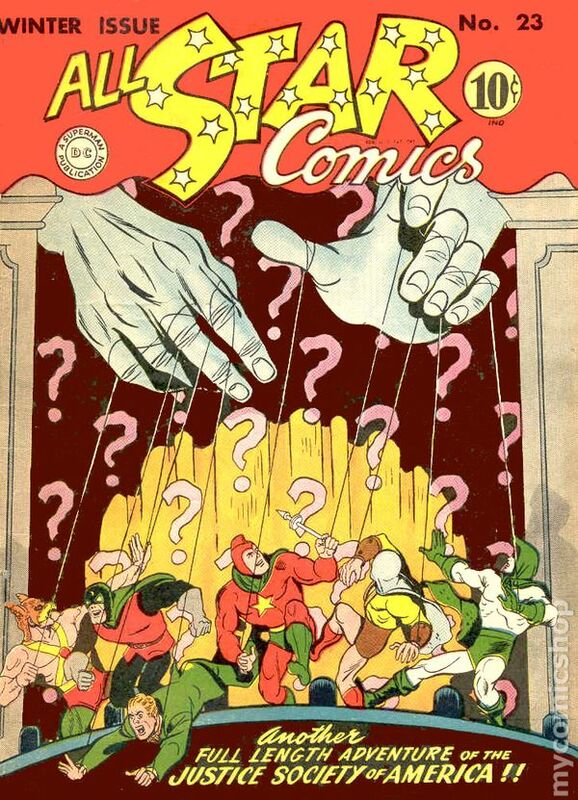 The Justice Society of America face "The Man Who Created Images!" Plot by Gardner Fox and Sheldom Mayer, script by Fox. 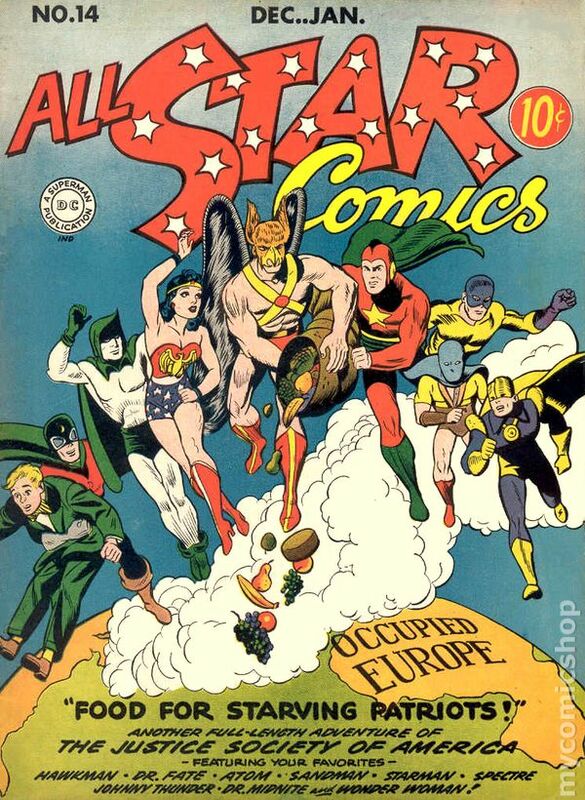 Art by Joe Gallagher plus individual chapters featuring Wonder Woman (art by Gallagher), Hawkman (art by Sheldon Moldoff), Dr. Mid-nite (art by Stan Aschmeier), Johnny Thunder (art by Aschmeier), the Atom (art by Gallagher), the Sandman (art by Joe Simon and Jack Kirby), Starman (art by Ed Dobrotka), the Spectre (art by Bernard Baily), and Doctor Fate (art by Howard Sherman). Two-page Hop Harrigan text story, "Death Rays From the Sun." Frank Harry cover. Cover price $0.10. 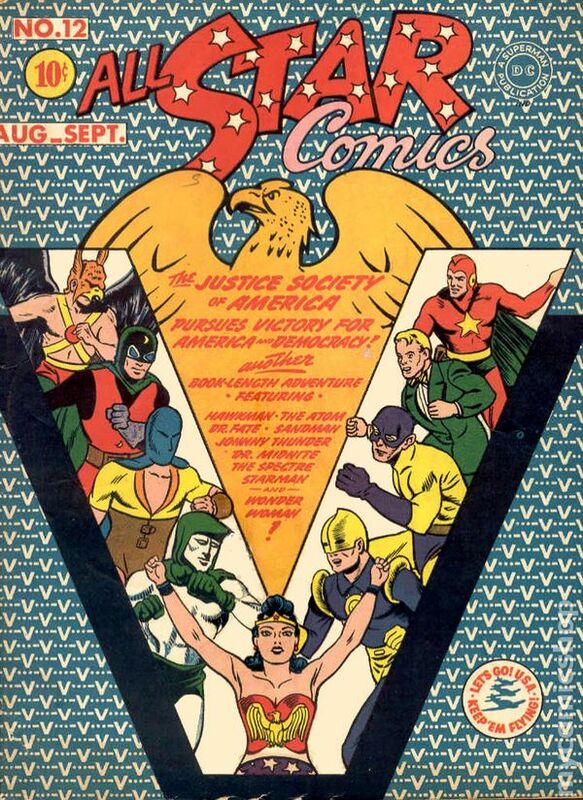 The Justice Society of America "Fights for a United America!" Plot by Gardner Fox and Sheldom Mayer, script by Fox. 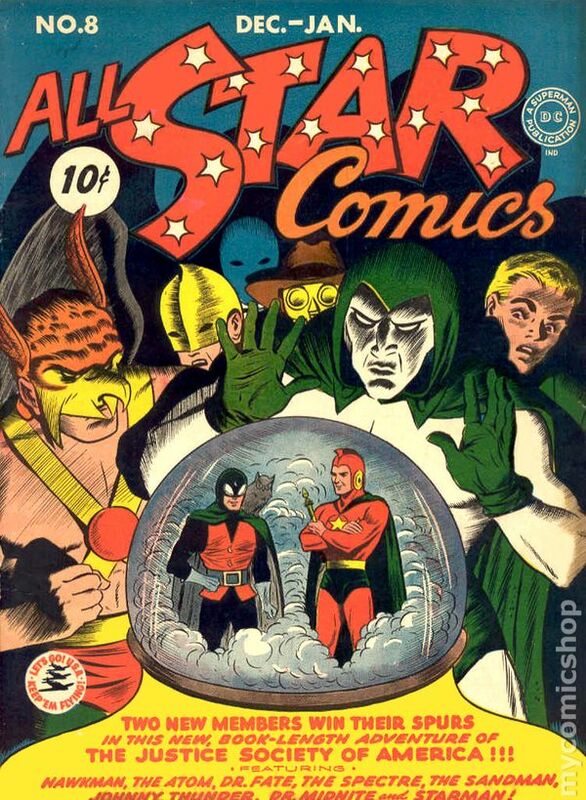 Art by Joe Gallagher plus individual chapters featuring Hawkman (art by Sheldon Moldoff), Dr. Mid-nite (art by Stan Aschmeier), the Atom (art by Gallagher), Doctor Fate (art by Howard Sherman), the Sandman (art by Joe Simon and Jack Kirby), Starman (art by Ed Dobrotka), the Spectre (art by Bernard Baily), and Johnny Thunder (art by Aschmeier). Wonder Woman appearance. Two-page Hop Harrigan text story, "Secret Weapon." Frank Harry cover. Cover price $0.10. Minor side edge crack. Scratching to front and back of slab. INCOMPLETE. First two wraps and one more page missing from first half of book. Interrupts art and story. The Justice Society of America head into action in "The Brain Wave Goes Berserk." Plot by Gardner Fox and Sheldon Mayer, script by Fox. 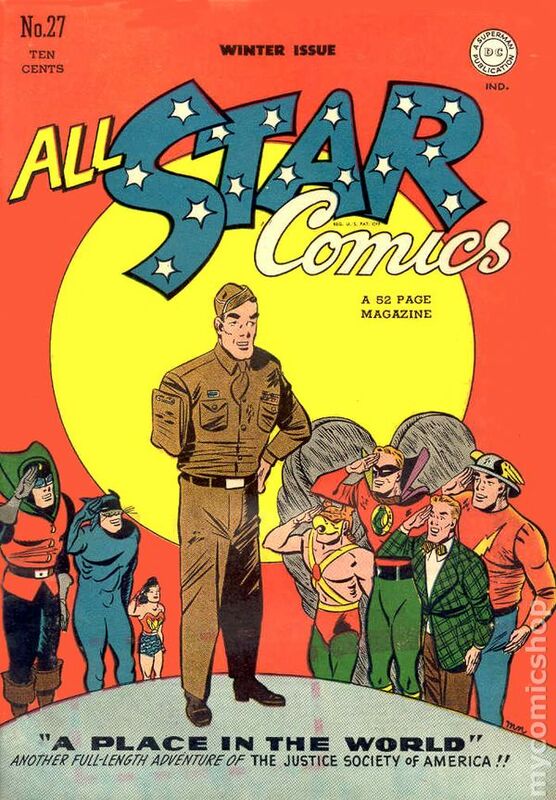 Art by Joe Gallagher plus individual chapters featuring Hawkman (art by Sheldon Moldoff), the Sandman (art by Joe Simon and Jack Kirby), the Spectre (art by Bernard Baily), Doctor Fate (art by Howard Sherman), Dr. Nid-nite (art by Stan Aschmeier), Starman (art by Paul Reinman), the Atom (art by Gallagher), and Johnny Thunder (art by Aschmeier). Wonder Woman cameo. Two-page Hop Harrigan text story, "Water, Water Everywhere." Gallagher cover. Cover price $0.10. 2" cumulative spine split, cover detached at one staple. 1" Spine split from top. Tape at spine. Staple rust. Fall 1943. 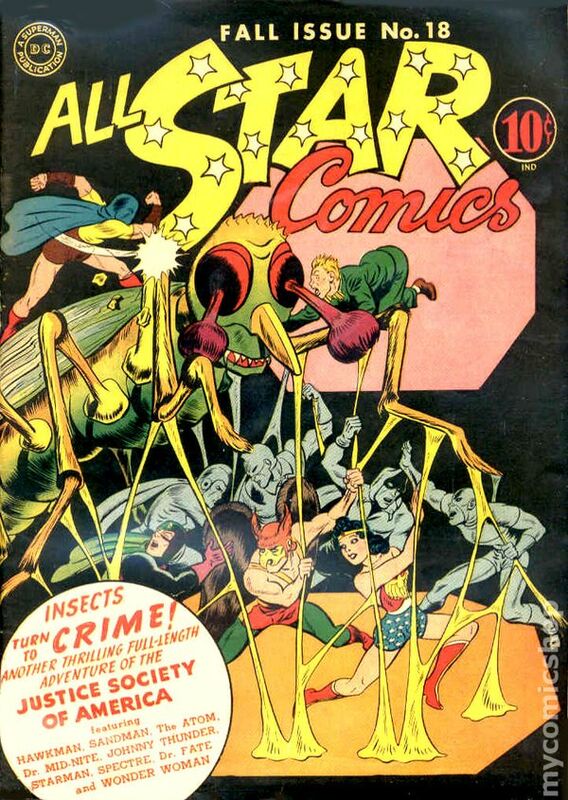 The Justice Society of America has its hand full when "Insects Turn to Crime!" Plot by Gardner Fox and Sheldon Mayer, script by Fox. 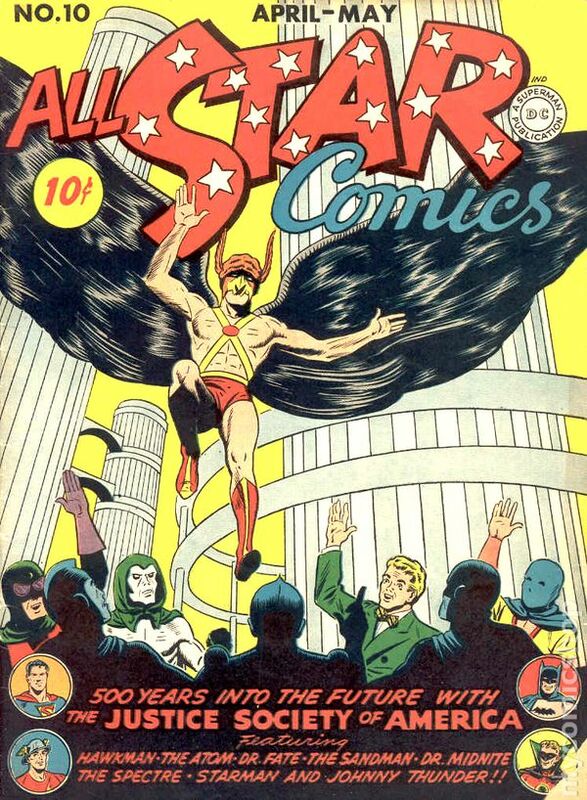 Art by Joe Gallagher plus individual chapters featuring Hawkman (art by Sheldon Moldoff), the Sandman (art by Pierce Rice and Arthur Cazenueve), the Spectre (art by Bernard Baily), Doctor Fate (art by Howard Sherman), Dr. Mid-nite (art by Stan Aschmeier), Starman (art by Rice/Cazenueve), the Atom (art by Gallagher), and Johnny Thunder (art by Aschmeier). Wonder Woman cameo. Full-page ad for the Junior Justice Society of America fan club. Combined full-page ad for Wonder Woman 6, Comic Cavalcade 4, All-Flash 12, and Green Lantern 9. Frank Harry cover. Cover price $0.10. Cover detached, heavy water damage. Winter 1943. 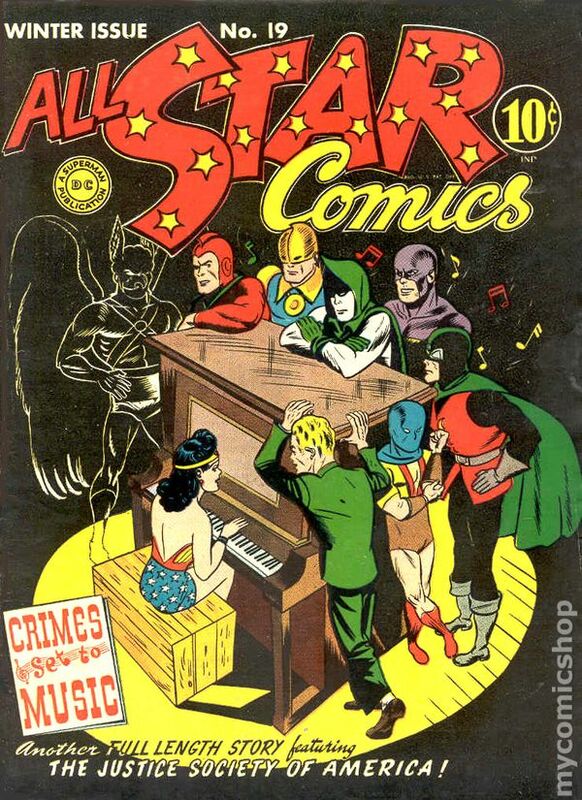 The Justice Society of America star in "The Crimes Set to Music!" Plot by Gardner Fox and Sheldom Mayer, script by Fox. Art by Joe Gallagher plus individual chapters featuring Starman (art by Stan Aschmeier), Johnny Thunder (art by Aschmeier), Doctor Fate (art by Aschmeier), the Atom (art by Gallagher), the Sandman and Sandy (art by Joe Simon and Jack Kirby), Dr. Mid-nite (art by Aschmeier), the Spectre (art by Bernard Baily), and Hawkman (art by Sheldon Moldoff). Wonder Woman appearance. Tootsie Roll back cover ad, "Captain Tootsie and the Great Jewel Robbery" by Rod Reed and C.C. Beck. 1+ page text story, "Hop Harrigan Over Torres Strait." Gallagher cover. Cover price $0.10. Cover detached, taped in place. Centerfold detached. Summer 1944. 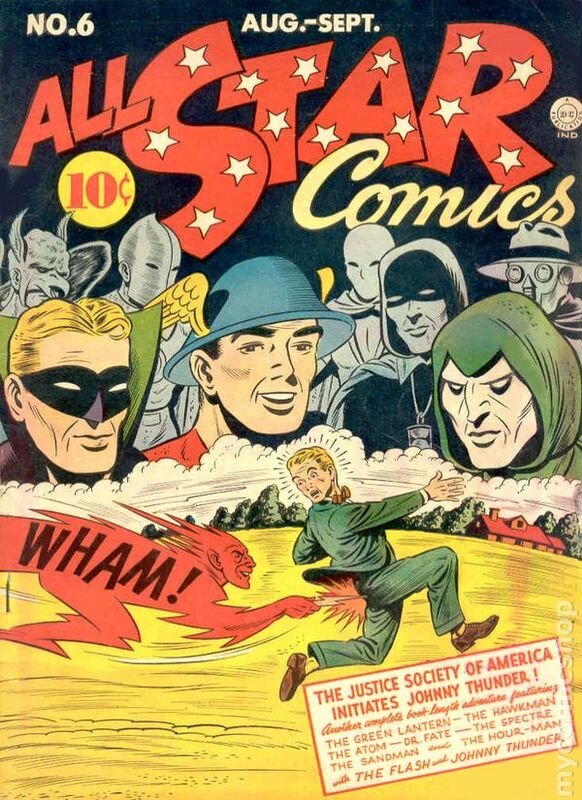 The Justice Society of America star in "The Man Who Relived His Life!" Plot by Gardner Fox and Sheldon Mayer, script by Fox. Art by Joe Gallagher plus individual chapters featuring Hawkman (art by Shaldon Moldoff), the Sandman (art by Gallagher), Starman (art by Aschmeier), Dr. Mid-nite (art by Aschmeier), Doctor Fate (art by Joe Kubert), and Johnny Thunder (art by Aschmeier). Wonder Woman appearance. Two-page Hop Harrigan text story, "Express to Berlin." Tootsie Roll back cover ad, "Captain Tootsie and the Bumbershoot Jump" by Rod Reed and C.C. Beck. Gallagher cover. Cover price $0.10. Fall 1945. 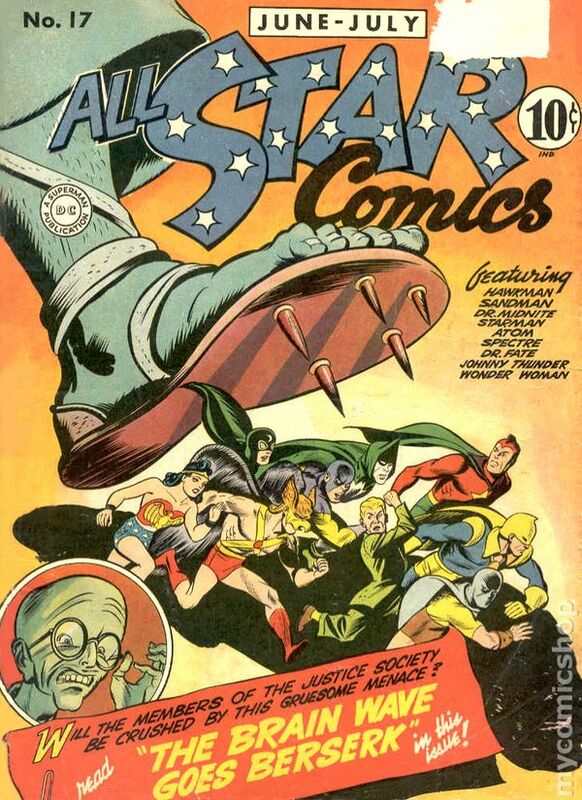 The Justice Society of America star in the fable-like "The Test of Time!" Plot by Gardner Fox and Sheldon Mayer, script by Fox. Art by Joe Gallagher plus individual chapters featuring Hawkman (art by Sheldon Moldoff), Starman (art by Stan Aschmeier), Johnny Thunder (art by Aschmeier), the Atom (art by Gallagher), Dr. Mid-nite (art by Aschmeier), and the Spectre (art by Gallagher). Wonder Woman cameo. Two-page Hop Harrigan text story, "Lend-Lease for China." Tootsie Roll back cover ad, "Captain Tootsie Battles Monster Man" (art by C.C. Beck?). Frank Harry cover. Cover price $0.10. Winter 1945. 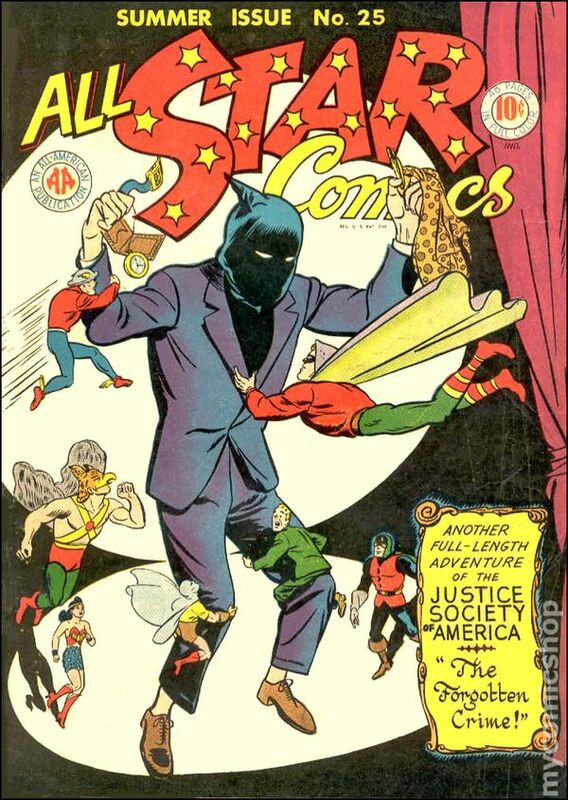 The Justice Society stars in "The Plunder of the Psycho-Pirate." Plot by Gardner Fox and Shaldon Mayer, script by Fox. Art by Joe Gallagher plus individual chapters featuring Hawkman (art by Sheldon Moldoff), Starman (art by Stan Aschmeier), Dr. Mid-nite (art by Aschmeier), Johnny Thunder (art by Aschmeier), the Spectre (art by Gallagher), and the Atom (art by Gallagher). No Wonder Woman. Two-page text story, "Peruvian Problem." Gallagher cover. Cover price $0.10. Amateur Conservation Includes: Tear seals to cover. Spring 1945. 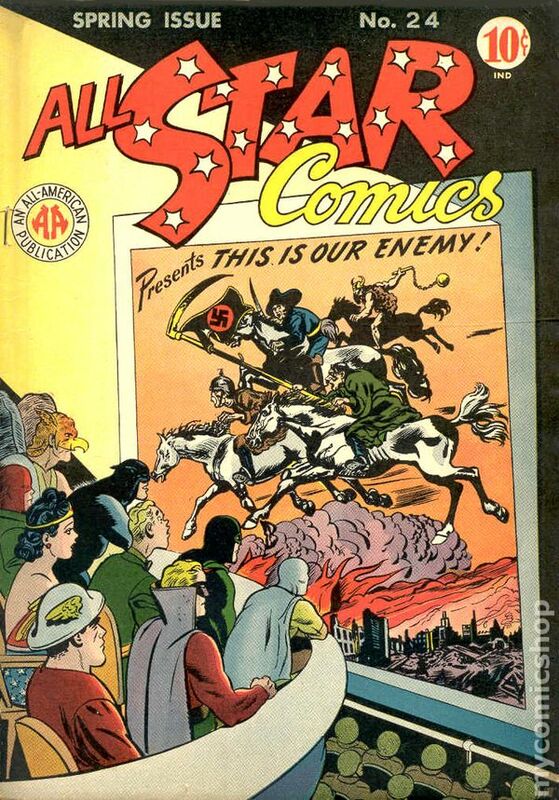 The Justice Society of America takes on Germany in "This Is Our Enemy!" The issue presents "the story of a nation--a degenerate nation whose people throughout the centuries have always been willing to follow their military leaders into endless, bloody, but futile warfare!" That's wartime comics for ya'. Script by Gardner Fox. Hawkman's chapter (with art by Joe Kubert--first art on the series) begins the story around 1250 A.D. Subsequent chapters feature Mr. Terrific in 1725 (art by Stan Aschmeier as "Stan Josephs"), Dr. Mit-nite in 1824 (art by Aschmeier), the Atom in 1872 (art by Joe Gallagher), Wildcat in 1896 (art by Gallagher), and Johnny Thunder in 1923 (art by Aschmeier). Flash, Green Lantern, and Wonder Woman cameos (art by Martin Naydel and H.G. Peter). Hitler cover and interior cameo. Two-page text story, "Glider Plight" by Jay Marr. One-page public service announcement, "Wonder Woman Explains Waste Paper Salvage." Gallagher cover. Cover price $0.10. Summer 1945. 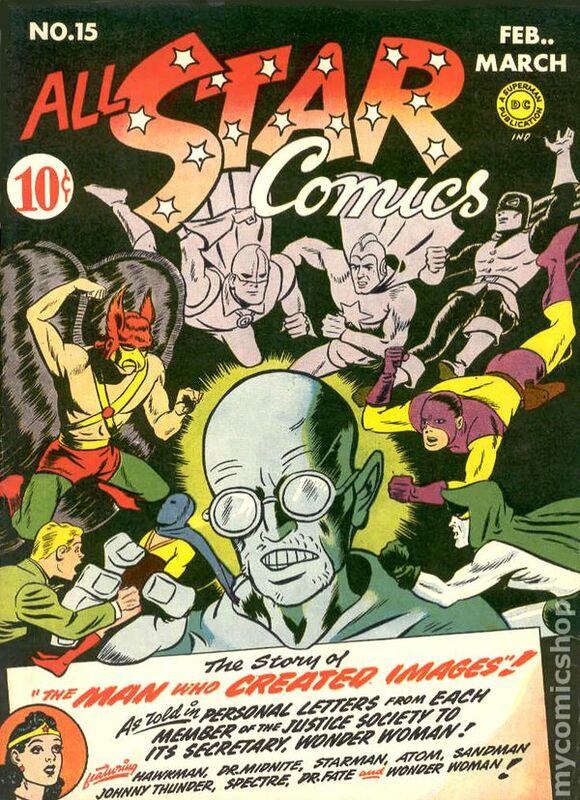 The Justice Society of America stars in "The Mystery of the Forgotten Crime." Script by Gardner Fox. Art by Martin Naydel plus individual chapters featuring Hawkman (art by Joe Kubert), Green Lantern (art by Stan Aschmeier), the Atom (art by Joe Gallagher), Dr. Mid-nite (art by Aschmeier), Johnny Thunder (art by Aschmeier), and the Flash (art by Gallagher and Naydel). Two-page text story, "Lead in His Shoes" by Jay Marr. Tootsie Roll back cover ad, "Captain Tootsie Captures Red the Terror" by C.C. Beck and Pete Costanza. Cover art by Gallagher and Naydel. Cover price $0.10. INCOMPLETE. RESTORATION. Staples replaced, piece fill to interior pages, tear seals and tape throughout. Includes a hand-drawn reproduction cover and first wrap (both attached). Fall 1945. The Justice Society of America battle robots (robot cover) from outer space in "Vampires of the Void!" Script by Gardner Fox. Art by Joe Gallagher and Martin Naydel, plus individual chapters featuring Hawkman (art by Joe Kubert), the Atom (art by Gallagher), Green Lantern (art by Stan Aschmeier and Naydel), Dr. Mid-nite (art by Aschmeier and Naydel), Flash (art by Gallagher and Naydel), and Johnny Thunder (art by Aschmeier). Wonder Woman cameo. Two-page text story, "Hurricane Orders" by Jim Robinson. Tootsie Roll back cover ad, "Captain Tootsie and the Hand Grenade" by C.C. Beck and Pete Costanza. Cover art by Gallagher and Naydel. Cover price $0.10. INCOMPLETE. First wrap and 20th page missing. Interrupts art and story. 1" tear through entire book. Chew. Winter 1945. The Justice Society of America examine the plight of the physically handicapped in "A Place in the World." Script by Gardner Fox. Art by Martin Naydel plus individual stories featuring Hawkman (art by Joe Kubert), Dr. Mid-nite (art by Stan Aschmeier as "Stan Josephs"), Green Lantern (art by Paul Reinman), Wildcat (art by Jon Chester Kozlak), Johnny Thunder (art by Aschmeier), and the Flash (art by Naydel). Wonder Woman cameo. Two-page text story, "Money Trouble" by Jim Robinson. Naydel cover. Cover price $0.10.